At the grisly murder scene of a teen prostitute, Virginia state trooper Riley Tatum’s past roars back to haunt her. When she was a teenage runaway, she was kidnapped, drugged, and left unconscious on the streets. She has no memories of what happened, only strange recurring dreams of two men playing cards. Former FBI agent Clay Bowman, Riley’s old flame, is Shield Security’s newest member. He’s plagued by the unsolved case of a serial killer nicknamed the Shark who murdered girls as part of a sadistic poker game. Only one girl survived. 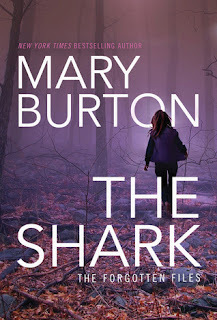 With the Shark now bent on evening that score, Clay has a chilling suspicion: Riley is the girl who escaped the Shark’s deadly amusement—and she is his next prey. As the Shark gets ready to play his hand, can Riley and Clay stop him—or will this killer finally claim the one who got away? I believe romantic suspense lovers are going to be thrilled with Mary Burton’s new series, The Forgotten Files. The first installment, “The Shark,” is centered around Riley Tatum, a Virginia State Trooper, who has worked exceedingly hard to get her life back on track after running away from home as a teenager and getting herself into a nightmarish situation she was lucky to have survived. She now specializes in ‘tracking,’ with her faithful dog, Cooper, and is adopting a troubled teen named Hannah. Her life has finally stabilized, until she finds a murdered prostitute with a hand of playing cards on her person, who also happens to bear a striking resemblance to Riley. Hoping to keep her troubled past from becoming public knowledge, Riley reluctantly teams up with Bowman to discover who it is playing high-stakes poker games with the lives of young women. This story is a traditional romantic suspense novel, but will also appeal to thriller fans too. The plot is very disturbing, featuring some of the most depraved bad guys I’ve encountered in recent memory. The plot twists shocked me so hard I nearly lost my breath! This one may not be for the faint of heart, as there are forensic details and the story is pretty dark. However, Riley is a fantastic character and her tenacity is inspiring. I enjoyed Bowman’s more low key approach, but bristled on occasion when he made decisions without consulting Riley. However, the two ended up working together quite well, and made a good team. The romance is slow to build, and while it is not the prominent thread in the story, it is a nice second-chance-at-love story which gave me hope that Riley will finally have a chance at having a real family and some long overdue happiness. “4-stars”! 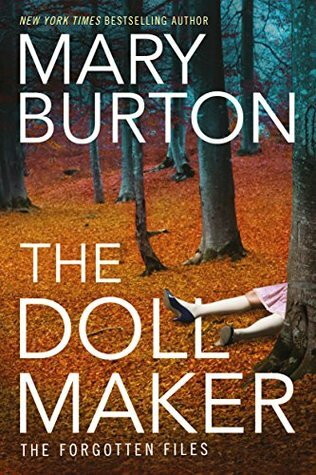 Mary Burton loves writing suspense, researching forensic and law enforcement procedure, baking, books, and tiny dachshunds. Not necessarily in that order. She also enjoys hunting down serial killers, which she does in her New York Times and USA Today bestselling novels of suspense and romance. She’s tracked them down in stories set in her hometown of Richmond, Alexandria, Austin and Nashville that have been praised by readers and reviewers. Her work has been compared to that of James Patterson*, Lisa Gardner** and Lisa Jackson***. Research is a favorite part of Mary’s work day. She never tires of learning more about police work, evidence collection and analysis, and doesn’t hesitate to take a hands-on approach, whether it means interviews with those working in the field, forensic seminars or lessons at the firing range. A Richmond native, Mary has lived there for most of her life. She is a graduate of Virginia’s Hollins University and worked in marketing before she began writing full time. Her first book was published in 2000 and now she’s the author of thirty-one novels and five novellas, including her contemporary women’s fiction written as Mary Ellen Taylor. Her new book, The Dollmaker is the second of her The Forgotten Files novels, which began with The Shark in May 2016. The third, The Hangman, will be published in spring 2017. Her recent bestsellers, the popular Morgan Family novels Vulnerable, I’ll Never Let You Go, Cover Your Eyes and Be Afraid, feature Nashville’s preeminent law enforcement family. When not traveling for research or visiting with readers at bookstores, book festivals and conferences, Mary is very much a homebody. She and her husband spend time alternately enjoying and lamenting their newly empty nest and spoiling their four legged babies Buddy, Bella and Tiki.